The Portsmouth Naval Shipyard is a major economic force in the the Seacoast providing jobs for residents and a living for local business owners and the cultural community. The closing of this installation would negatively impact the local economy for years and most likely degrade the quality of life Seacoast we all enjoy. Given these facts, keeping the shipyard open should be important to everyone. 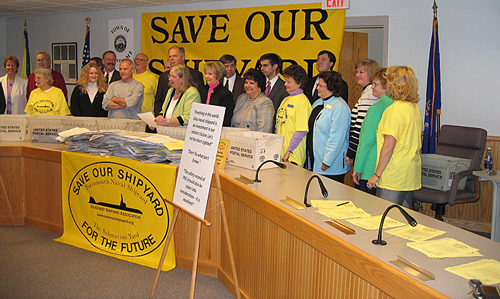 We invite everyone to join our team and to support efforts to keep the shipyard. 4,800 WORKERS at the Portsmouth Naval Shipyard are doing their part to keep their jobs by providing the U. S. Navy with superlative work, universally acknowledged as the best nuclear submarine overhaul and refueling operation in the country. MAINE AND NEW HAMPSHIRE,through financial & congressional support, are behind the efforts coordinated by the Seacoast Shipyard Association. PORTSMOUTH, KITTERY, BERWICK, ELIOT, NORTH BERWICK, SANFORD, SOUTH BERWICK, WELLS, YORK, DOVER, GREENLAND, NEWINGTON, ROCHESTER, ROLLINSFORD, RYE AND STRATHAM are doing their part through financial contributions.